Barrick reports earnings ahead of Randgold merger; both companies increase dividends. Excelsior Mining lands financing for Gunnison. Detour Gold, Goldcorp hit a low point. Here's a look at those top stories and more in the gold mining sector for October 2018. I've scoured through various gold mining newsletters, company websites and presentations to find the top news of the past month for October 2018. This list includes takeovers, mine production updates, quarterly earnings and other relevant news to keep readers up to date on the sector. October was a pretty rough month for a few gold miners in particular, but there were a few bright spots in the sector, too. Also, gold prices have begun to rally bit on Thursday. The World Gold Council reported that central banks added $5.8 billion worth of gold to their reserves during Q3, the most since 2015 and a 22% year-over-year increase. Gold prices rose 1.8% Thursday on this news and have continued an uptrend since hitting a low of $1,175/oz back in mid-August. The VanEck gold miners index (GDX) is also up 3.67% on Thursday, but has underperformed the price of gold given its leverage to the yellow metal (gold miners typically outperforms on rallies and underperforms on sell-offs). Of course, this could change if gold prices resume their recent rally. Here's the top news in the gold, silver and copper mining sector for October 2018. On Oct. 1, Coeur Mining (CDE) completed its acquisition of Northern Empire. Northern Empire's main asset is the Sterling Gold Project. The high-grade Sterling Gold Project is a past-producing mine with all major permits in hand and it has near-term, low-cost, low-capital production potential, the company says. 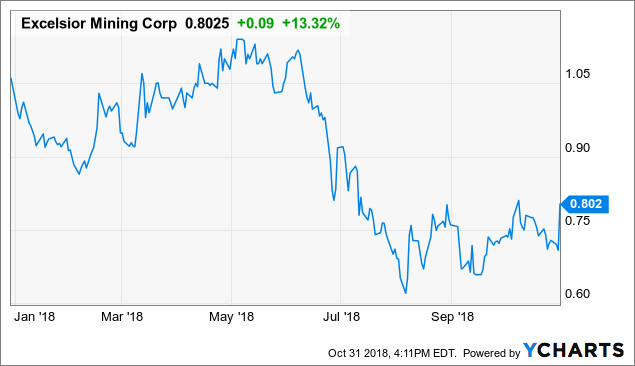 On Oct. 16, Coeur also announced that it has agreed to pay $19 million to Alio Gold (ALO) acquire a property package adjacent to its Rochester operation in Nevada. The properties include the Lincoln Hill and Wilco Projects, as well as the Gold Ridge Property and other nearby claims. Harte Gold (OTCPK:HRTFF) celebrated the grand opening of the Sugar Zone Mine in Ontario on Oct. 24. Back on Oct. 3, the company started processing ore from its stockpile. The next step is to declare commercial production (Q4 2018), followed by a resource update (Q1 2019). The company expects to increase Sugar Zone production to 100,000+ ounces of gold per year by 2021 (at $700-$750 AISC), and potentially higher if it can upgrade resources and discover new ounces on its 83,850 hectare property. Asanko Gold (AKG) reported record quarterly gold production of 61,599 ounces at its Asanko Gold Mine in Ghana. The company says it is now tracking on the high end of its H2 2018 guidance of 110,000 - 120,000 ounces. This is likely to please 50% JV partner Gold Fields (GFI), which spent $185 million to acquire its interest and form the JV back in July. 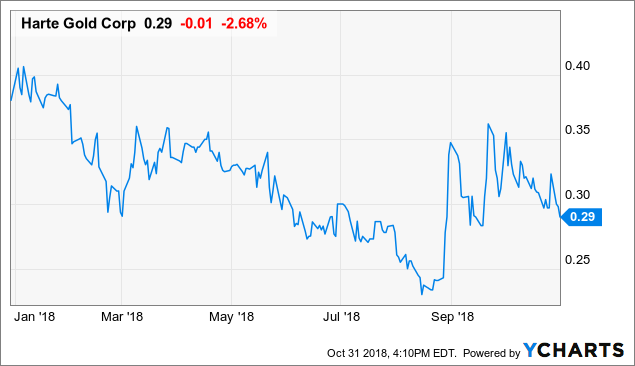 However, keep an eye out for the company's Q3 financial results, as Asanko is forecasting its all-in sustaining costs to fall between $1,050 - $1,150/oz, which would leave it with pretty tight margins at current gold prices. The stock is down more than 20% since formation of the JV with Gold Fields. B2Gold's (BTG) Q3 gold production rose by 78% to 242,040 ounces on the strength of its flagship Fekola mine, which contributed 107,002 ounces. This led to an increase in gold revenues by 110% to $324 million vs. the same period last year. B2Gold also has announced an increase in the mineral resource estimate for Fekola. According to the company, the mine now contains 5.73 million ounces of gold, which most resources in the indicated category. The company is undergoing a new mine design plan based on this resource estimate, to increase its current gold reserve base of 3.7 million ounces. B2Gold's Q3 financial results will be released on Wednesday, Nov. 7. Excelsior Mining (OTCQX:EXMGF) announced completion of the permitting process for its Gunnison copper project in Arizona earlier this month. Excelsior then announced on Oct. 31 that it has secured a $75 million project financing package with Triple Flag Finance. The financing consists of a $65 million copper stream and a $10 million private placement of shares. Triple Flag also has the option to double the stream for an additional payment of $65 million. Triple Flag will receive 16.5% of the copper produced in stage I production at Gunnison at 25% of the copper price; with 25 million pounds of copper expected to be produced annually, this means Excelsior will receive approximately 4.125 million lbs. With copper at $2.75/lb, Triple Flag would earn around $8 - $9 million in annual cash flow for stage I. The stream drops to 5.75% in stage II (75 million pounds per year) and 3.5% in stage III (125 million lbs. per year). With $49 million initial capital required to get Gunnison to production, this financing more than covers Gunnison's initial capital requirements. Excelsior shares increased by 17% Wednesday as the market appears to be happy with the financing news. Streaming and royalty newcomer Maverix Metals (OTCPK:MACIF) recently agreed to buy a new silver stream on Northern Vertex Mining's Moss Mine in Arizona. The mine is expected to produce between 224,000 - 248,000 ounces of silver in 2019, doubling to 451,000 - 487,000 ounces in 2020 (in addition to 30K+ ounces of gold in 2019 and 52K+ ounces in 2020). For an upfront payment of $8.5 million, Maverix will have the right to buy 45% of the silver produced from the mine, for ongoing cash payments equal to 30% of the spot price of silver. Once Maverix has received 1.5 million ounces of silver, the stream drops to 22.5% of the silver production for the remainder of the mine life. There's also an option for Northern Vertex to increase the payment by $5 million in exchange for Maverix receiving more silver ounces. Maverix has been among one of the top performers in the sector this year. 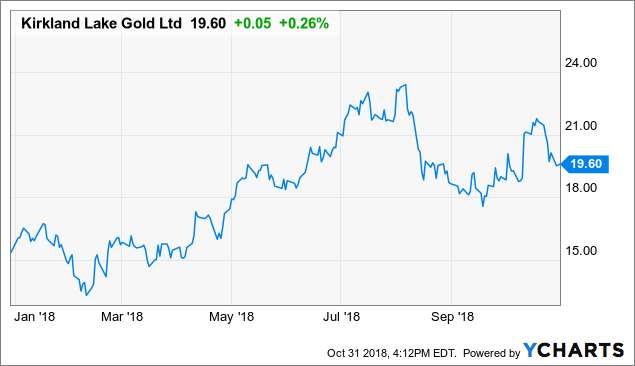 Top gold stock Kirkland Lake Gold (KL) announced that Q3 earnings totaled $55.9 million, or $.27 per share, free cash flow of $52.2 million, up 41% from $37.1 million in Q3 2017. EBITDA of $119.6 million represented a 20% increase from 2017, and just a slight decrease from the record produced in Q2 2018. Kirkland Lake Gold has been one of the strongest performing gold miners this year. Detour Gold (OTCPK:DRGDF) did not fair as well. The struggling miner reported Q3 gold production of 151,402 ounces with AISC soaring to $1,377/oz, up from $1,104/oz last quarter. This led to a tiny net earnings of $12.7 million. The company blamed the higher costs partially on higher contractor and maintenance costs and higher fuel and electricity costs. Cash costs aren't expected to fall below $1,000/oz until 2021, according to the updated life-of-mine plan. 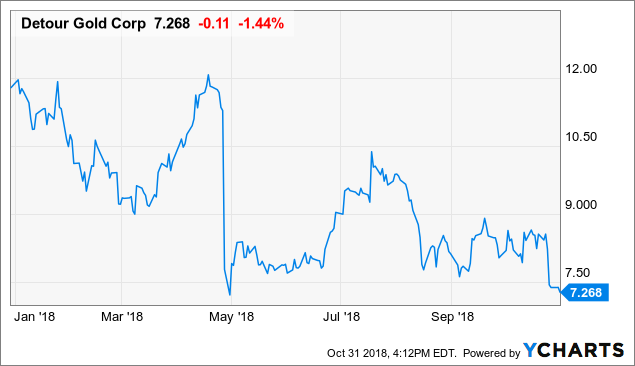 The company is waged in a battle against one of its shareholders, Paulson & Co., over the future of the company, as Paulson has pushed for a company sale. 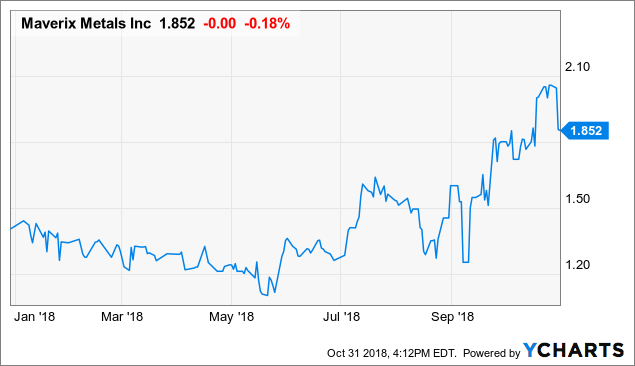 Detour proposed a settlement that would see half its board refreshed and removal of its CEO, but Paulson has reportedly rejected the offer. 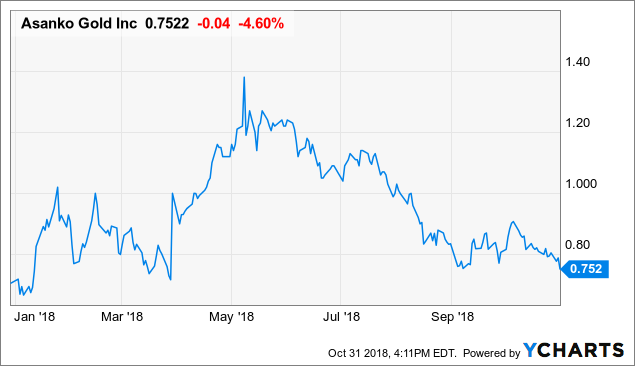 Detour has just $94 million in net debt so there's little risk of insolvency, but I would avoid shares as I don't see much upside in the short-term, and resolution of the battle with Paulson & Co. is uncertain. Shares are down over 40% YTD. Count Goldcorp (GG) as another miner that likely wants to put Q3 earnings in its rearview mirror. Goldcorp reported a net loss of $101 million, or -$.12 per share, due to lower production of metals from the Penasquito mine. The mine commissioned the Pyrite Leach Project during the quarter, leading to lower throughput and grades. Gold production totaled 503,000 ounces at $999 AISC. However, Goldcorp believes production will rise to 620,000 ounces at $750 AISC next quarter as almost all of Penasquito's production will come from higher grade ore in the main pit. 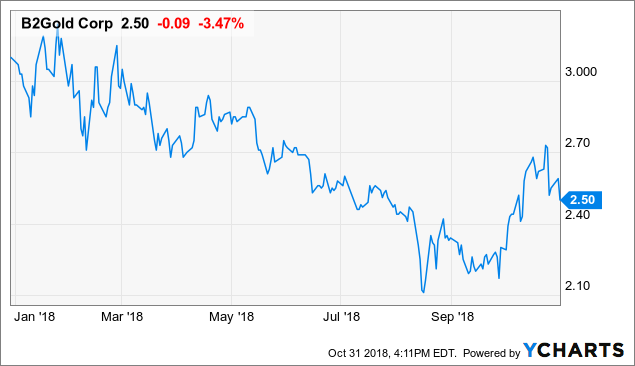 A few days after earnings, Goldcorp announced a normal course issuer bid (or share buyback program) under which it can repurchase up to 5% of its total shares outstanding. Goldcorp's shares are down 45% YTD and the stock could certainly use the boost. 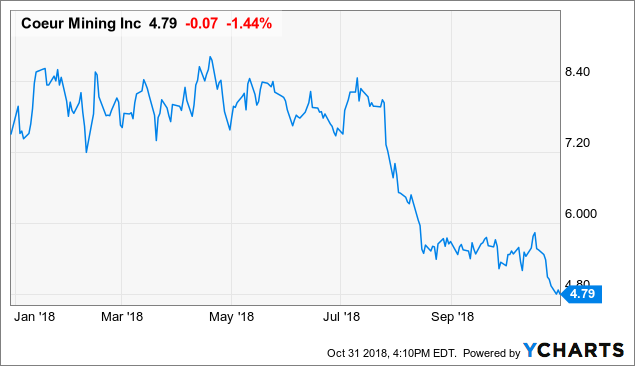 Barrick Gold (ABX) is yet another major gold miner that reported a large net loss in Q3, of $412 million, or ($.35) per share. This was due to a $405 million impairment charge at the Lagunas Norte mine in Peru. 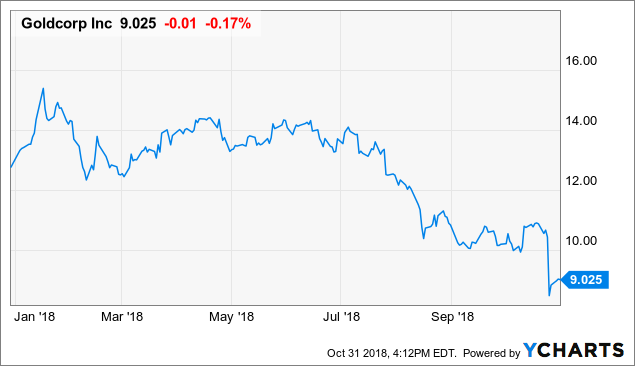 Barrick did have strong free cash flow of $319 million in Q3, however, which is good to see ahead of its upcoming merger with Randgold Resources (GOLD). Net debt is now $4 billion and will likely fall much further following the merger. Randgold also reported that its Loulo-Gounkoto gold mining complex in Mali is getting back to its normal run-rate and is expected to see higher grades in the third and fourth quarters of the year. It also says discussions have begun with Mali to form a potential joint-venture to explore a regional area with exploration upside. 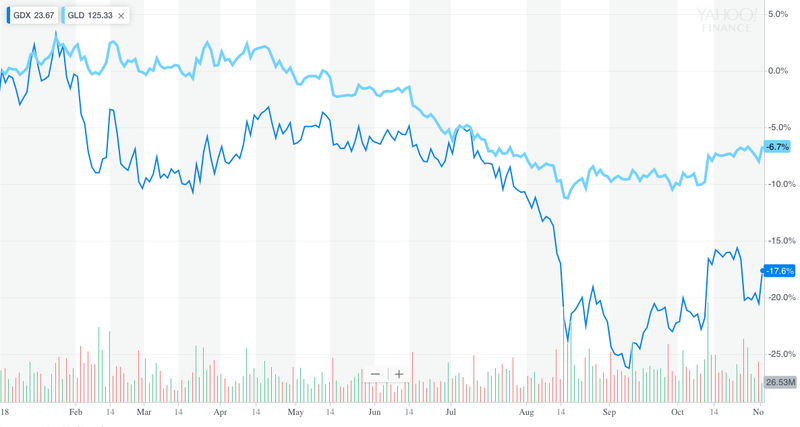 Finally, Barrick and Randgold both agreed to raise their dividends ahead of their merger; Barrick increased the quarterly dividend to $.07/share from $.05/share, while Randgold boosted its annual dividend to $2.69/share from $2.00/share. 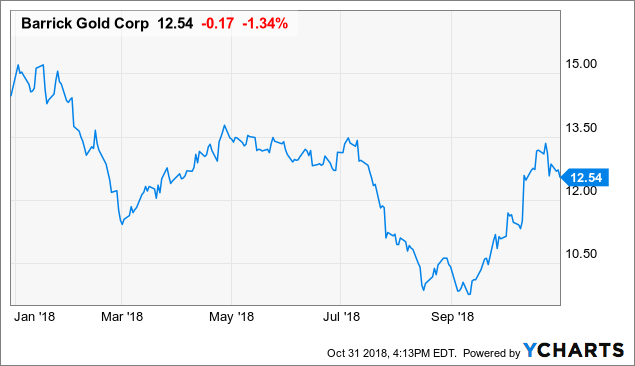 Upon completion of the merger, the new Barrick will target an annual dividend of $.16 per share ($.04 paid per quarter), so the miner appears confident in its ability to return cash to shareholders. Subscribers of The Gold Bull Portfolio received early access to this article. Subscribers will also receive a full list of my Top Gold Stocks for 2019, which will be released shortly, and get a full view of my real life gold portfolio holdings. Please consider signing up today for access to these picks, plus a look at my real-life gold holdings and weekly gold updates. Disclosure: I am/we are long KL. I wrote this article myself, and it expresses my own opinions. I am not receiving compensation for it (other than from Seeking Alpha). I have no business relationship with any company whose stock is mentioned in this article.